Chances are you’re a Pinterest loving mom who, like me, never ends up getting to many of the projects you pin. See my extensive library of pins on my Crafts and DIY board. However, I’ve probably only done about 5 of those projects. When I compare my love of crafting to how much time I actually spend crafting, it makes me sad. Enter Home Made Luxe and my idea to create your own craft night was born! When you create your own craft night, you’re really killing two birds with one stone. On one hand, you’re investing in yourself, which is top notch self-care. On the other hand, you’re spending time on a hobby for yourself, something that most parents admit they don’t do enough. Home Made Luxe is a subscription box that sends you a new home decor project every month! If you’re a Pinterest loving but Pinterest challenged mom, this is totally the one thing you need to create your own craft night. Not only is it crazy affordable—have you looked at the prices at the craft store lately? !—but all the tools and supplies you’ll need are included. Plus, Home Made Luxe includes directions in every box and even has video tutorials on their website. While you wait for your first box to arrive, follow along with Home Made Luxe on Instagram, Facebook, and Pinterest. You can even get sneak peeks at next month’s craft! Skipping a month whose project is not your cup o’ tea is easy and totally free, too. Deal Alert! Get 50% off your first Home Made Luxe box with code: EPICSALE. Use it anytime with any subscription, forever! Subscribe now and SAVE BIG. If you’re more of an introvert like me, create your own craft night as a solo adventure. In this case your craft space may end up being a desk equipped with Netflix, an organizer for all your supplies, and lots of room to spread out and tinker in peace. To me, that sounds like heaven. I love my kids and all, but sometimes I just want to craft without also having to supervise and instruct. If you’re looking to create your craft night as a social playdate for moms, designate a craft space for a group. For example, the dining room table or a folding card table you pull out into the middle of your living room are great options. Further, a converted buffet, cube shelving, or rolling craft cart are all good options for storage in between craft nights. And like I mentioned earlier, Home Made Luxe sends all the supplies for each month’s project! So, you really only need space to sit and create. Whether alone or with a gaggle of your mom friends, treat yourself to all the fixings. Pour yourself a glass of wine, fix up a nice cheese and cracker plate, and grab a bowl of your favorite munchies. I like to have something on in the background, too, so I don’t tune into the noises of crazy children outside my door. Most often that’s music in the background or an episode of Chopped or Adam Ruins Everything. I also love to throw a handful of yummy brine-y things into my food processor to make my favorite olive tapenade! It’s delicious on Sociables, though my mother-in-law prefers the really fancy thin crackers. Residents of USA who are 18 years or older are eligible to win! Giveaway ends December 29 at 11:59 pm. I would love a string art kit, they looks like a lot of fun to do and they look cool when you are done! I would love a soap making kit. It would be so much to make soaps. I like the gemstone soap making kit. It would probably be to make holiday ornaments. I collect ornaments and that would be ideal. I would love to have a candle making or a soap making kit. I’d love to make surprise bath bombs or candles. wow so cute and fun! I would love home decor craft kit. I’ve seen a ton of cool pins on making your own bath bombs, so I’d love to get a bath bomb crafting kit. A soap or bath salt making kit would be nice. I think a jewelry kit or soap making kit would be fun. Scrapbooking / card making party kit. That is really a hard choice but I would have to say a craft kit to make a weathered wood board for my home with a saying on it. Omg how fun! I was just chatting with a bestie about having a craft night! Soap making would be perfect for us as we’ve always wanted to make those! Sounds like a great kit! I would love a knitting kit. something to make cards with! Thisis sweet, I would like to do a home décor kit! i like the jewelry kit and the string art. i really like the string art. I would like the macrame project kit. All great ideas for a great DIY craft night. I’ll be sure to bring the wine, lolol. I would love a lot about how to learn how to crochet. 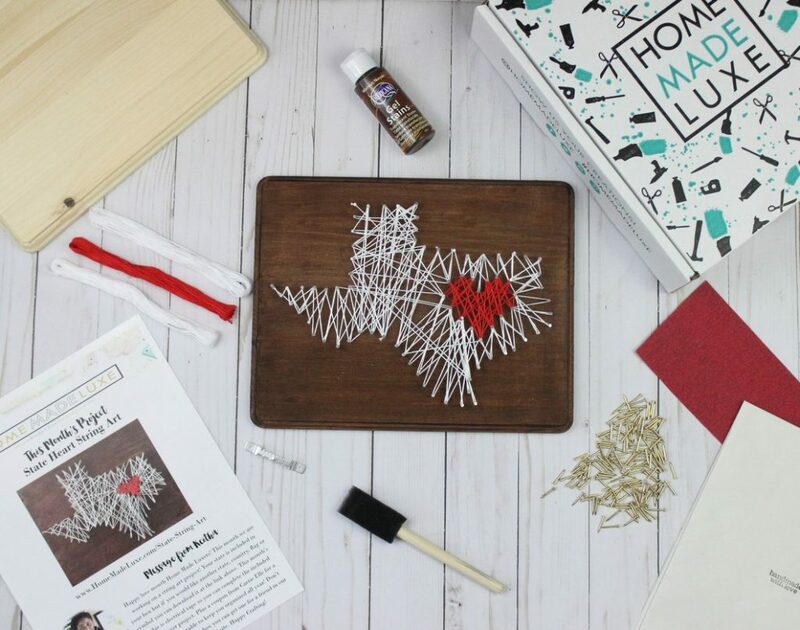 Love the idea of having a monthly craft night, need to give it a try and I absolutely love the State Heart String Art!! I’d want a doll or teddy bear making kit. I love cute things. Christmas 🎄🎅 ornaments crafting ! Doing a new craft every month so even on not so good days I am still learning growing brain cells. I love this idea of a craft box — I want to do more crafts and this is such a super way to do it. I would love to have a box with mosaics! I’ll keep these tips in mind and use it to make craft time with little ones who visit fun! Thank you. I’d like a doll making craft kit. I would like a Calligraphy craft! Holiday crafty things for Christmas, Easter, Valentines….all sorts of fun! I am always open to learning a new craft. I have been working on felt ear bud holders lately. I’d love to learn how to make wire wrapped jewelry. I’d love to make finger puppets! I’d really love to learn how to make collars, clothes and toys for cats & dogs. Looks like such a fun subscription box! Crafting is a ton of fun. I’d love to try out some napkin/placement craft! For the giveaway… if I could receive one craft kit, I’d like it to be a card-making kit. Hi… the craft box looks lovely…. I am a little nervous because I am not receiving my original Oxford Momma pampering boxes, and your Facebook page has no posts between June 22 and December 9. The boxes were so wonderful, a high point for me each month! I like card making kits! I like many different crafts and quilting! I would love to learnh how to knit. Soaps, picture frames , candles, anything with plants! Small cross stitch kits with frames. I like making soaps and candles. Love to make a nice frame with shells or glass. Aww..I’ve always loved the idea of Craft Night. It sounds so much fun! I should definitely have my central craft space! I love the idea of a craft night, so cool and fun. Thanks a lot for the tips, i am so hyped about this. I love these ideas! I have always wanted to have a dedicated craft space. I just feel like it would make things so much more efficient and fun. So I’m not much of a crafter, but we just bought a house and I just can’t afford to buy all the expensive stuff. So we are going homemade and I have a lot to learn! That’s exactly what got me into home decor crafting! I use to do little crafty things like making soaps and bath salts and candles and embroidery. Then we bought our house, and we had a baby. When you’re broke you get crazy crafty, lol!